With the Christmas Season approaching, one thing you’ll notice at the mall is proud pet owners shopping for their cats and dogs. According to a recent survey by the APPA (American Pet Products Association), about half of all cat and dog owners include their pets on their Christmas lists. Sound crazy? The numbers are even higher in a poll by PetFinder.com, where 63% of those that owned dogs and 58% of cat owners give their pets Christmas presents. Time Magazine cites a figure of 50 million dollars annually spent on the practice. 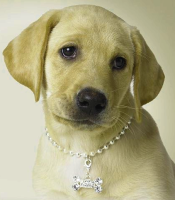 Some of the giving is quite lavish as well, everything from pet jewelry (see: LilyLobster beaded dog collars) to $1000+ treadmills, made expressly for dogs. So when is it too much? The popular magazine Psychology Today uncovered two drivers that making this phenomenon more common. The first reason is the increasing number of American couples that are either are childless, or have choen to have fewer children. They also cite an additional factor where our increased life spans have older parents experiencing the “Empty Nest”, when their children move out of the house, for a much longer period of time than in the past. Dogs and cats, in this situation, provide the parents with something to raise and take care of. This “surrogate” status often produces the strong bond that causes some pet owners to feel like their pets are children. So, while it may be a little unsettling to see your “crazy Aunt” dressing up her dogs and bringing them to your holiday dinner, it’s good for her. Unless it’s causing a real issue beyond seeming a little silly, it’s probably best just to bite your tongue and let her enjoy the companionship.